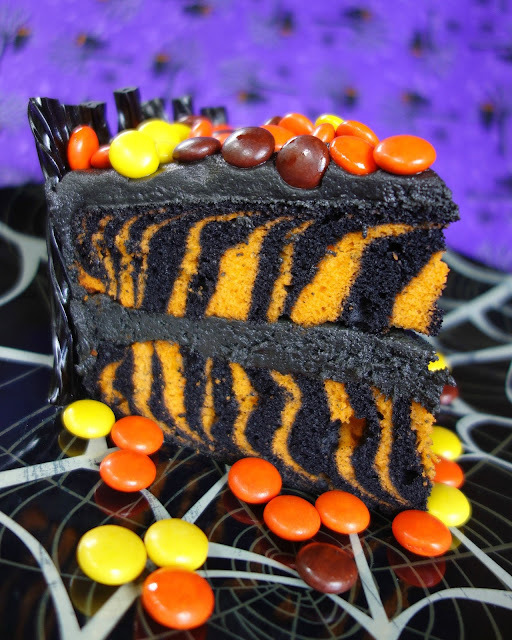 Spooktacular Halloween Cake - orange and black zebra cake surrounded with black licorice and topped with Reeses pieces. Use cake mix for a quick and festive Halloween treat! YEARS ago, I made a cake decorated with Kit-Kats. It was so much fun! 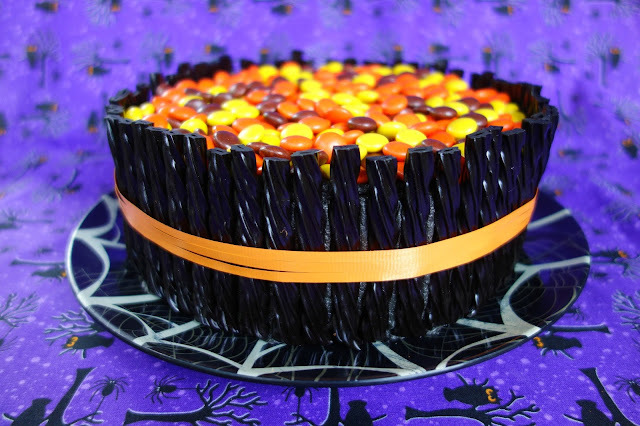 I decided to put a Halloween twist on that cake and use black Twizzlers and Reese's Pieces for the decorations. I think it turned out super cute spooky! I took this cake one step further and make a orange and black zebra cake. I used a box of white cake mix for the cake, but you can make your own. Since I used a cake mix, I decided to make homemade chocolate buttercream. It delicious! I tinted the buttercream black for Halloween. It looked creepy, but it tasted great. Bake cake according to package directions in two 8-inch cake pans. Cool completely. In the bowl of an electric mixer fitted with the paddle attachment, beat butter until smooth and creamy, 2 to 3 minutes. With mixer on low speed, add chocolate until just combined. Add cream, vanilla, and sugar; mix on medium until well combined. Add black food coloring if desired. Frost cake with chocolate buttercream. Cut Twizzler's to size - about 1/2-inch taller than cake. Press Twizzlers on edge of cake. Top cake with Reese's pieces. Now that's what I call a great Halloween cake! Love the way you have striped the layers and that black frosting is over the top. Very spooky indeed. This is so awesome!!! Love it! I LOVE this cake! The orange and black zebra is so neat! My family would really get a kick out of this! Amazing cake, love the inside pattern. Spooky! This is too fabulous! I made your Iron Bowl cake last year so I know how great this turns out, what an over the top cool Halloween cake! Eye and Tummy Candy! You just combined two of my loves-cake and zebra!! Love this so much! !